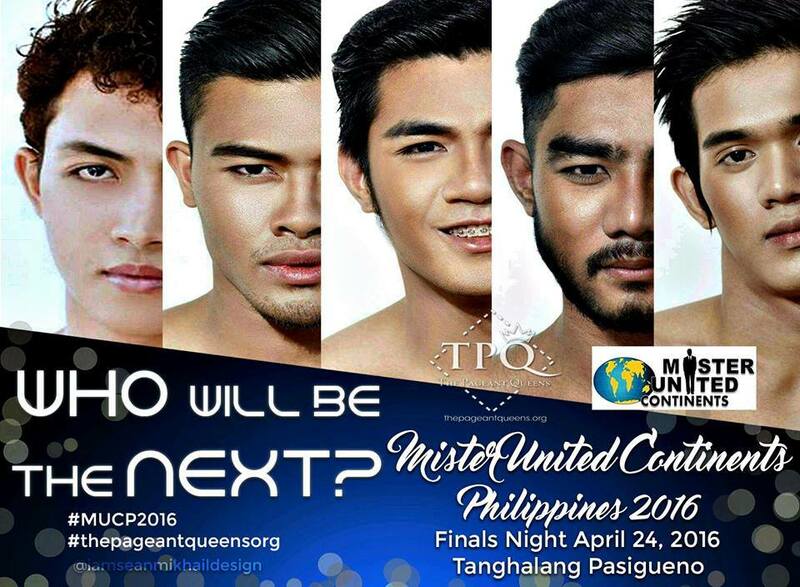 The official candidates of Mister United Continents Philippines 2016 were presented to the media last April 14, 2016. The contestants will be promoting their respective advocacy with the mission, "Service to Humanity and Environment is the Best Work of Life." 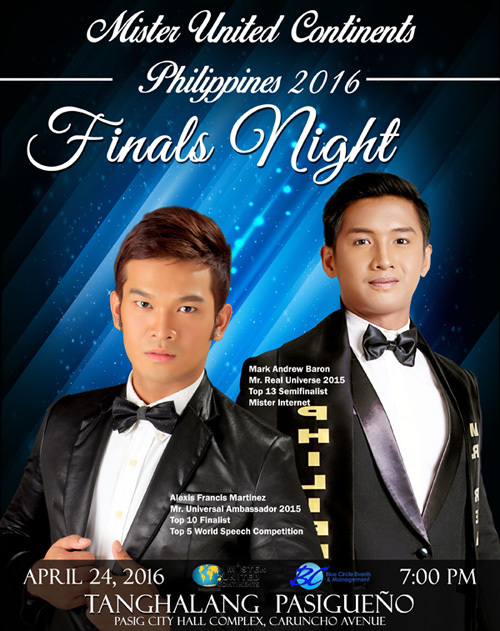 The finals night will be held on April 24 at Tanghalang Pasigueno in Pasig City. Jeffrey Montibon - 24 years old, 5'10 (Agusan Del Norte) - an ex-OFW and a freelance model. Jaymark Quintana - 25 years old, 6'0 (Angeles City, Pampanga) - a Freelance model and a Marine Transportation gradute. Virgilio Llego - 22 years old, 5'11 (Argao, Cebu) - a farmer, accounting and a professional model. Joeser Sinfuego - 23 years old, 6'0 (Baao, Camarines Sur) - an artist, painter and professional model. Celso Salon Jr. - 27 years old, 5'9 (Camiguin Province) - a registered nurse and call center agent. Chuck Orillaneda - 27 years old, 5'11 (Cebu City) - an Advertising and Multimedia arts graduate, and a runway model. Kevin Dale Jovellano - 20 years old, 6'0 (Cotabato City) - a freelance model. Jay Daniel Chuong - 23 years old, 5'10 (Davao) - a mountaineer and a fitness instructor. Jerson Corullo - 21 years old, 5'10 (Guinobatan, Albay) - an Education student majoring in Mathematics. Emerson Cosme - 21 years old, 5'10 (Imus City, Cavite) - HRM student and a dancer. Aga Tommy Cayampat - 23 years old, 5'10 (Lucena City) - a photographer and a Marine Transportation graduate. Neil Kervin Regis - 23 years old, 6'1 (Malasiqui, Pangasinan) - a nursing student. Mark Carluz Guiuo - 25 years old, 5'11 (Nueva Ecija) - an AB Development Communication graduate and a training development supervisor. He speaks Nihongo, Mandarin, Spanish, Portuguese and English. Jade Anthony Dulay - 22 years old, 5'9 (Pampanga) - a car collector and BS Tourism graduate. Issa Janda - 20 years old, 6'2 (Polangui, Albay) - BS Criminology student and he is the reigning Ginoo ni Daragang Magayon. Jayser Casipit - 20 years old, 5'9 (San Miguel, Tarlac) - a freelance model.